We now have a Conservation Restriction (CR) on the 28-acre Woodhaven Farm on Prospect Street. This critical protection to the Estabrook Woods was accomplished with the combined help of numerous supporters and contributions from our partner, Sudbury Valley Trustees. In addition, Carlisle’s wonderful citizens voted at the 2016 Annual Town Meeting to allocate $850,000 of Community Preservation Act funds for permanent protection, via CR, of the historic 20-acre Sorli Farm south fields on Westford Street. 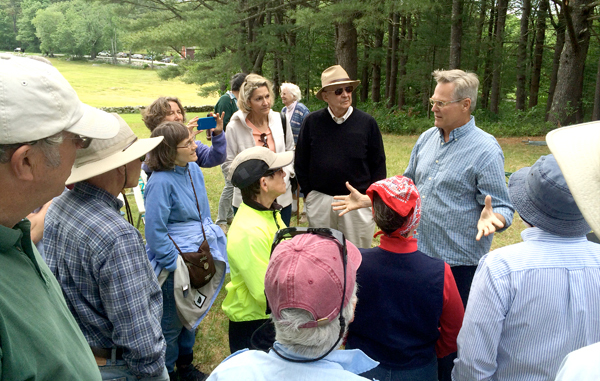 Above, on a blustery June afternoon, Larry Sorli provided attendees with an overview of the history of the farm from 1745 through his family’s involvement beginning in the early 1900s. CCF offers nature programs and walks, all free and open to the public. We have continued our sponsorship of the Blanding’s turtle program in the Carlisle Public School and have expanded our outreach to Carlisle’s school children by offering overnight camping and before-school walks. Above left, Carlisle children eagerly await a fun overnight campout at Spencer Brook Reservation, culminating with a campfire and S’mores. Center, an early morning frolic at Towle Field, one of several midweek jaunts before the school day organized by CCF parents and friends to get their kids out in nature on Town and CCF conservation lands. Right, avid birders on a recent bird walk arranged by CCF, mesmerized by a merlin and another hawk in a midair skirmish over Great Meadows. 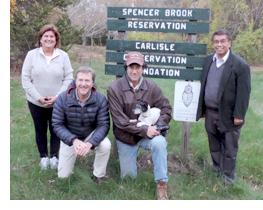 We welcome four new board members this year, pictured at CCF’s flagship property, the Spencer Brook Reservation, left to right: Dale Ryder, Drew Williams, John Keating, and Manuel Crespo. Dale has lived in Carlisle for 25 years and has served in several elected positions in Town government and has been an active volunteer in many local organizations. Drew has a degree in environmental policy, worked for the Nantucket Land Trust, and runs a software marketing and development company. John is a retired Environ­mental Engineer and served for a decade on the Conservation Restriction AdvisoryCommittee. Manuel is a business and technology lawyer and has served on the Carlisle Zoning Board of Appeals since 2005. Our annual appeal is our main source of funding for these activities. All of your contributions are tax-deductible and go to our nature programs and protecting Carlisle’s open spaces for the future. Thanks to all our supporters!